Huawei Mate 20 Pro vs Galaxy S10 Plus. We’re all agree, that the Huawei Mate 20 Pro is one of the top three powerful Android smartphone from last year, if it’s not the best of all, with its 7 nanometer production process, Kirin 980 chip and so much more powerful features. But at the release of this Samsung’s new flagship (Galaxy S10 Plus), we can no longer say that. At least till we did some tests and comparison, to see which one is the winner. And the S10 Plus is at the Exynos 9820 model, which is actually an 8 nanometer chip but we have seen that it demonstrates a huge speed. And in this Huawei Mate 20 Pro vs Galaxy S10 Plus review, we’ll show you the results of our tests, and how S10 Plus stacks up against the May 20 Pro. The boot-up time of any smart device, depends on different factors. There are certain cases where the device takes more time than it should in normal states. It depends on what the device was doing on the background, before you shut it down. So, for a perfect boot-up test, we should test the devices to each other for three times or more to get the real result. 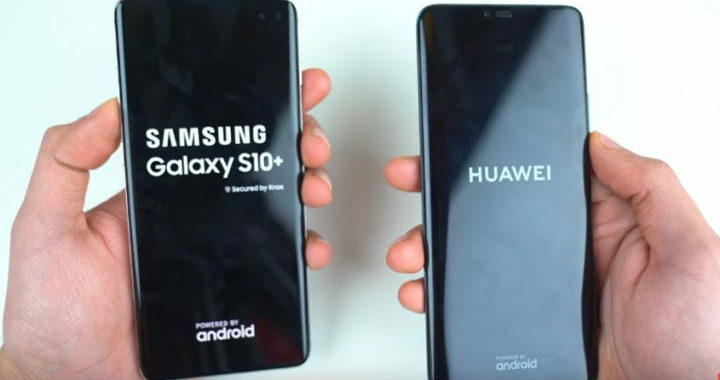 In the case of Huawei Mate 20 Pro vs Galaxy S10 Plus, both phones booted up at the same time. But again, there are different factors. and this result maybe correct and may not. Because, we tested a phone that has been in use for a couple of months, with the S10 Plus which is just unboxed a few days ago. The Galaxy S10 Plus, was a bit quicker than mate 20p in this test, and there is a reason for that. The S10 Plus has the most advanced ultrasonic image scanner, in which you don’t need to push on the screen in order to unlock your phone. Whereas the mate 20 Pro. still uses the optical scanner, that uses the screen light to read the finger pattern. And that forces you to apply a push over the screen to allow the optical scanner to read your fingerprint. While we’re talking about Apps and games, let’s point out certain important things. I’ve seen so many guys on YouTube doing these type of executive tests, but we can’t judge any phone based on those test until they respect certain mandatory rules. And these rules are: 1- you have to differentiate between the official Apps, and the third party Apps. But, what is a third party App? Generally, all apps that aren’t from the root of the system, could be considered as third party Apps. Another crucial rules to respect if you want to do a perfect test, is to make sure that none of these apps is running any tasks on the background. Some apps have been built to run certain tasks automatically at the boot-up. And because most companies now don’t use the pure Android system but they customize the system before flashing it into their devices, chances are more to find some devices that rejects these Apps from running at the start-up, and devices that allow the apps to run their tasks. So, you need to, either pay attention while you’re installing them, or go to task manager and stop them.